It's all about the kids and unfortunately I don't have waivers from the kids for this blog. I DO have permission for the PCA web site though, so go there to see lots more (and frankly better) photos. Last week, Sebastian and I got together with a big group of rising sixth-graders and volunteers for a walk through a part of Charlottesville and its history. The following week, the kids made a mural and told stories about their experience at the Free Expression Wall (Community Chalkboard). It was fun and really inspirational. The walk started at the Jefferson School and wound through the once-vital-and-now-disappeared neighborhood of Vinegar Hill, the one-time heart of Charlottesville’s African-American community. The walk proceeded down Main Street, with a stop at the historic Paramount before concluding at the Free Expression Wall. All throughout, we studied the urban fabric and heard about what was there before, and helped the kids record their observations through both words and drawings (field packs provided). 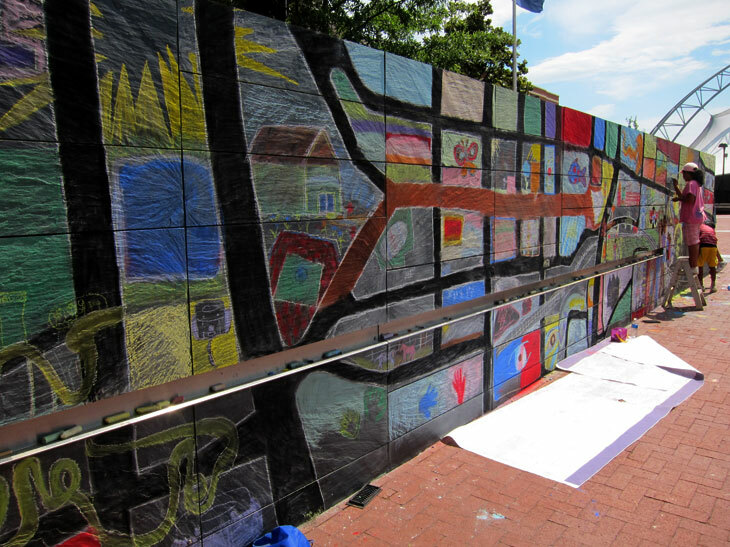 The chalkboard drawing was a wonderful outlet for the kids to record their impressions and dreams for the city. It is worth noting that the children did not generally draw anything specifically related to the history lessons the adults had recited to them. Theirs was a more generalized vision that ranged from green to fairly dark, channeling memories, hopes, and dreams—often quite abstract. The project reminded us that there are many layers of meaning in the places we inhabit daily. It was intended to awaken the latent and very human urge to share—through whatever means at our disposal—our own thoughts and impressions. Free expression is a right that must be nurtured and protected: not only against suppression or censorship but from our own fears and inhibitions that silence us. We have some interesting things to say and if we make an effort to share them, we will inspire others. The children certainly inspired me and I hope our efforts helped some of them as well. From what I witnessed, I think there’s reason for optimism. Forty-eight hours later, the mural had completely disappeared under the sea of commentary passersby write on the chalkboard. Perhaps it was victim of an afternoon shower or squall. It doesn’t realty matter for all expression is fleeting. It’s not a durable product anyway: it’s a process and one that needs to be exercised. Story|line is a collaboration between the Piedmont Council of the Arts, the Bridge, Charlottesville Parks and Recreation, and the Thomas Jefferson Center for the Protection of Free Expression. Labels: Charlottesville, Story|Line, Urban landscape, Why Art?